Winter is a tough time for solar power: less sunshine, lower solar irradiance and shorter days mean significantly less power generation, and if you have an off-grid system, you have another issue as well - cold batteries. Lead acid batteries quite simply don't like the cold. Optimum temperature is 25°c (77°F) and when battery temperatures drop below 15°c (59°F), the capacity of the battery decreases markedly. At below 8°c (46°F), most batteries are providing around half of their rated capacity and at temperatures below 0°c (32°F) you risk damaging the batteries. 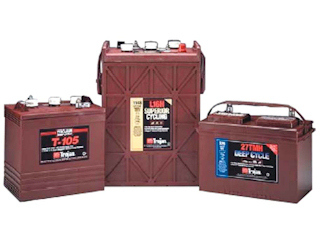 Batteries generate their own heat through use, so if your batteries are in use - and especially if they are fully charged - they will maintain their own temperature well above the ambient temperature. As autumn turns to winter, it's time to check your battery pack and make sure that it is topped up with distilled water (if appropriate). Check the battery connections are nice and clean and the connectors are firmly fitted. Copper grease can be used around the connectors to ward off the damp and make sure the connection is as good as possible. Check the environment the batteries are installed in. Is it dry? Is it vented to ensure there can be no hydrogen build up? Once you've checked that your battery pack is in good condition, it is time to insulate your batteries to provide extra protection against the cold winter nights. First of all, look at where your batteries are stored. Are the batteries standing on a concrete floor? If so, put them on a wood base - concrete floors can get very, very cold and this cold can easily transmit itself through a battery casing and into the battery itself. Once you have done that, it's time to insulate the bottom and the side of your batteries. I use foil backed bubble-wrap which is claimed to have the same insulating properties as a 60mm layer of polystyrene (styrofoam) and has the benefit that if you ever get battery acid splashes on it, it does not disintegrate. I fold it over twice to give extra insulation. Do not use this insulation for the top of the batteries. Firstly, this insulation conducts electricity and could short your batteries. Secondly, it is important that the batteries are allowed to vent in order to avoid hydrogen build up. Make sure you leave at least 2" air gap between the batteries the insulation. Make sure you leave venting space at the top of the roof box that is free from insulation, in order to allow hydrogen to vent from the batteries. You can buy battery powered digital garden thermometers at reasonable price. These thermometers have two temperature sensors - one within the unit itself and a remote temperature sensor. These thermometers are designed to be mounted inside with the second probe mounted outside. It allows you to compare indoor and outdoor temperatures. Look for one that records the lowest and highest temperatures, so you can see how cold your batteries are getting without having to get up in the middle of a freezing night to check it! These thermometers make great battery temperature monitors. Stick the second probe on to the battery pack and place the thermometer itself close to the battery pack so it can read the ambient temperature. The thermometer will allow you to monitor the temperature of your pack on an ongoing basis. If you have insulated your batteries properly, you should always find the battery temperature is 8-10 degrees warmer than ambient temperature. If your batteries are getting too cold, you may need to consider moving them or insulating them or protecting them in some way in order to make them warmer. Failure to do so will result in poorer performance and is the number one reason for premature failure in batteries. Michael Boxwell is a technical architect and designer. He is the author of a number of books including the Solar Electricity Handbook and The Electric Car Guide series of books.